Home Care Sheets & Guides Do Betta Fish Need Light? Dark? How Many Hours Per Day? We all want our fish to live healthy, long lives, and using the right kind of aquarium light, for the correct number of hours each day, can really help with that. So in answer to the question: ‘Do betta fish need light?’ The answer is a definite YES! And you should also know that a regular, daily period of darkness is just important. But there’s many other questions regarding aquarium lighting that need answering too. And that’s where this article will help. The natural day time/night time light cycle for your fish and why it’s so important. What Kind Of Light Do Betta Fish Need? Is Sunlight Better Than Artificial Light For a Betta Tank? How Many Hours Light And Dark Do Betta Fish Need Each Day? How Many Watts Do You Need For The Size of Your Betta Tank? When it comes to choosing a betta’s aquarium lighting, the best thing to remember is the closer you can get to mimicking their natural environment, the happier and healthier your fish will be under your care. In the wild, these fish live in relatively shallow standing waters such as canals, rice paddies and floodplains. So unlike deep water fish, Bettas are used to a more natural daylight/nighttime cycle—and this is exactly what you should aim to provide. If aiming to mimic their natural environment, then sunlight must surely be the best right? Well, it’s hard to argue against this fact but if you prefer to rely on natural sunlight, be warned that it comes with some disadvantages. Natural sunlight can cause algae to bloom, fouling the water and potentially leading to your fish suffering from bacterial infections. So if you choose to expose your fish to natural light, check often for algae growth and be ready to react. Another important thing to consider when keeping your tank near sunlight is water temperature. Smaller tanks can act as magnifying glasses and heat up the water enough to make it uncomfortable and even dangerous for your fish. Even larger tanks can fluctuate in temperature with natural sunlight. The first rule of thumb for choosing an artificial light is to choose one that won’t affect the temperature of your tank. Betta fish need a temperature of approx. 74 to 78 degrees Fahrenheit—any higher and you run the risk of overheating your fish and possibly killing them. Incandescent bulbs aren’t recommended as they’re highly inefficient, almost giving out more heat than light and acting like mini suns! Especially bad for small tanks that will heat up very easily. Choose LED lights if at all possible. LEDs mimic natural sunlight, don’t encourage algae growth, are highly energy efficient (cheap to run) and show off your fish’s colors to best advantage too! Fluorescent (CFL) light bulbs are another good choice if LEDs aren’t available to you and are the most commonly seen and used in fish keeping at the time of writing. Once you’ve installed your tank light, don’t forget to turn it off nightly! Think of your fish as Goldilocks. Too much or too little light is no good for them. Here’s why. Light is essential for your fish for the same reasons it’s essential for you and me. Better said, it’s daytime / nighttime cycles that are just as essential for them as they are for every other living being. If you’re up and about during the day, you’re diurnal, which means that when the sun goes down, you’re ready to sleep. Betta fish are diurnal too—and they also need a daytime / nighttime schedule to know when it’s time to sleep. This is why it’s important to remember to turn off your fish tank light. Betta fish typically need 8 to 12 hours of light, and 12 to 16 of darkness, so make turning off your tank light a pre-bedtime habit. If your Betta fish has too much light, it can become overly stimulated and stressed. You’ll see this stress play out in feeding habits mostly: Some Bettas won’t eat at all when stressed by too much light. You may also see stress lead to more serious illness because a stressed fish has a weakened immune system, making them more susceptible to disease. Too much darkness isn’t good for your betta either. These fish tend to lose their color without sufficient exposure to light, but there could be other factors, so make sure to check the pH level of your water, the temperature and algae levels in your tank to rule out other possibilities. Too much light – and not enough darkness – also highly stresses your fish because they don’t know night from day, when to sleep, when to wake and their body clocks go crazy. So regular periods of darkness are just as important as providing light. Contrary to popular opinion, you don’t actually need to calculate wattage per gallon. This is considered an outdated measuring method by most at-home aquarium experts. If you do prefer a rough guide, typically for LEDs you need 1 watt or less per gallon. For fluorescents, 1.5-3 watts. Both LED and fluorescent bulbs can provide a considerable amount of light per single bulb, so you shouldn’t worry too much about buying more than one tank light or buying one that’s oversized – unless you have a large tank or are have live plants with intense lighting requirements. But keeping in mind that the best tanks for betta fish are in the 5 to 10 gallon range, powerful lighting is almost always unnecessary. If you have a male betta, after you’ve installed your new aquarium light, watch him for any signs of “abnormal” behavior. If you notice him flaring up aggressively, it could be that the tank light you’ve chosen is reflecting too much and turning the walls of the aquarium into a mirror, making him think there’s a rival fish in the tank. Once you’ve settled on the best aquarium light, there’s an easy, foolproof way to make sure you never forget to turn off or turn on the lights: An automatic timer. 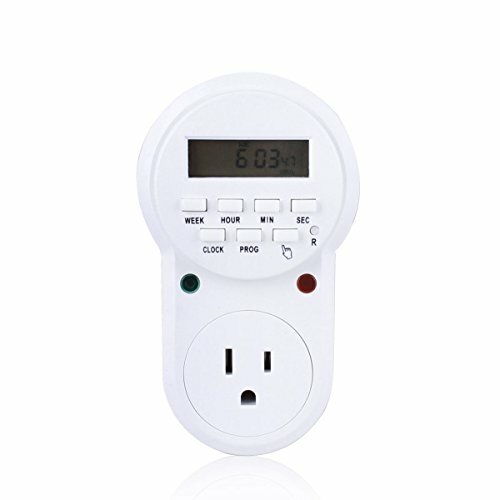 Plug-in timers are relatively inexpensive ($10-$25) and save you a lot of worry and hassle. Simply plug it into the nearest outlet and plug in your aquarium light. You can then program your timer to automatically mimic daytime / nighttime cycles for your Betta fish. The timer will switch your aquarium lights on and off at the set times daily, completely hands off and worry free for you, even when you spend days away from home. We cannot recommend enough the use of a time. 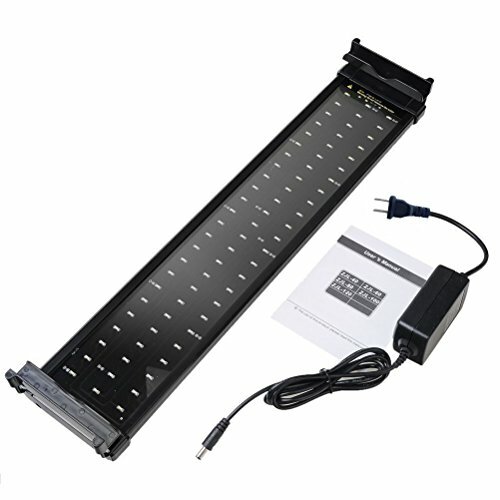 Choose an artificial light source over sunlight for more control over daytime/nighttime cycles and a lower chance of your tank accidentally overheating. LED bulbs should be your top choice. LEDs are economical, provide plenty of light for a low wattage, and won’t heat the water in your tank. Fluorescent light bulbs are a good second choice. Always avoid incandescent bulbs. Use an automatic timer to control when your tank light is turned on and off for a hands-off, hassle-free experience. Watch your fish for any changes in mood or behavior. It might be a clue that your tank light is causing problems, such as transforming the tank into a mirror or over-stimulating your Betta. Have you already tried out tank light sources? Share in the comments and let us know which setup works best for you. And for further advice on keeping and caring for betta fish, please click here to see our detailed guide on betta fish care. What times should I open my aquarium light for my beta fish, I just got it today. Also, after about 12 of light, does the beta fish need a completely dark room? It’s best to give them a normal day and night cycle, consistently similar times, as explained in the article above. Bettas like calm water. Rising bubbles cause currents in the water, and due to their large fins and tail, they get caught like the wind in a sail and have to then constantly swim to remain still, fighting against the current. So it’s preferred they have water with very little current. So the answer is mostly no, however, if the tank is large, has lots of plants and decorations to break up currents and create dead spots and hiding places, it can be OK to have bubbles in the tank. Just be observant and check to make sure your betta is happy with it. Please see our article here for more details: Bettas and bubbles. Bettas and Bubbles: Do Betta Tanks Need An Air Pump?